This article will suggest approaches in developing a product to the point where it can be marketed in the small business federal government contracting venue. Individuals usually succeed at such an endeavor by forming a company, separating it from their personal assets and then developing the company and its product(s)/service(s); even if it is only a one-person operation at the start. Service contracting is another form of gaining entrance into the market, creating opportunities for introducing products by selling skilled labor under a government agency service contract or prime contractor teaming arrangement. A GSA schedule affords a platform for products and services but sales must have been achieved historically in the commercial or government markets before applying because GSA relies heavily the most recent 2-year pricing data in negotiating a schedule. The government contracting product and services venue is competitive and requirements by federal agencies are often bundled into larger systems procurements. Therefore, it is necessary first to position a small enterprise and its product offerings before tapping the federal market for development support. Financing is always a factor and can be achieved through loans or investors with a good business plan. The remainder of this article will address the basic elements of a framework within which to succeed with your product development for federal government contracting. Instructions for registering in your state and federally with the IRS are available at your state web site and at the IRS site. You will receive tax and employer identification numbers by registering your business. Patents and copyrights for your idea may ultimately protect you to a degree but the government agencies granting them have no enforcement arm so you must discover a violation yourself, retain a lawyer, bring a court proceeding against a violator and then hope to recover your costs and a reasonable settlement if you win. Therefore, most of my clients use non-disclosure agreements (NDA’s) in dealing with other companies. Teaming is a practical fact of life in pursuing the larger federal government contracts. You can download an NDA from the “References” Box Net Cube at the right margin of this site. Fill in the blanks as appropriate for a given exchange with outside individuals and companies. Before you meet to disclose details with a potential teaming company or investor, for instance, ask them to sign the document with you up front, put a serial number on it and reference the serial number and the agreement and date on any written materials you give to them. After the meeting draft a short letter, documenting the minutes of the meeting, what was discussed and stating that the verbal disclosures and materials in the meeting are subject to the agreement and reference the agreement by number and date. Put an acknowledgment line on the letter and ask them to return a signed copy to you. This confirms their receipt of your proprietary information and their agreement to protect it in accordance with the NDA. There are certain exceptions with regard to individuals or companies you may be dealing with on investing where you may not choose to use an NDA. Some Angel and Capital Investors are sensitive about being asked to sign them. You will have to trade their objections off against the value they represent to your company and conduct your risk analysis on a case-by-case basis. Articles on strategic planning and developing your marketing plan are also at the “References” Box Net Cube at this site. They address evolving an operations vision for your enterprise showing its potential to present to a banker or to an investor. It may assist you in visualizing your own business growth to look at an example of how someone else addressed a given topic. I have learned from having worked with many new business owners that it is best to have you examine the material and continue your plan, contacting me with issues and questions as they occur. Locate teaming companies to further the objective that they would market your product as part of their offerings with your company licensing and sharing in the proceeds. A business plan and the guidance above for its generation is the road map for developing ideas, laying out how to expand the sales of your product and researching your market to do so. It will also assist in developing pricing to considering the direct costs of product development, service implementation and distribution as well as the indirect costs of the enterprise itself (operating expenses).must be considered and financed. 1. Does a developer or teaming partner have a strong but realistic incentive to actively make the product a part of the marketplace? 2. Does market research indicate the idea will have strong sales volume once it is developed and distributed? 3. How much will a prospective teaming partner or investor have to invest in the product to get it to market? Does the product require testing? 4. Which is the better deal? Is it better to receive a 7% royalty on $5,000 worth of sales or a 1% royalty on $500,000 of sales? Even though 1% does not sound too impressive, of course it’s the better choice in this example. A negotiation position should be based on support by for the argument that a concept will experience a certain level of sales and the royalty should be based on a % of estimated end user volume sales, discounted for the investment that the developer and distributor must make to get it to market. The royalty should be outside of the distributor cost breakdown and the end user cost breakdown. It is simply a deductive factor the manufacturer will have to introduce into their profit equation after the costs have been tabulated. They should not view royalties as a cost factor; they should view them as a share of the profit on the total estimated sales. Chances of succeeding with a negotiation with a developer and/or distributor are increased by showing understand the prospective market for the product and drawing some comparisons between the product and other similar successful products. Naturally there will be some give and take with the other side about estimated costs to get the product to market. Be forthright in acknowledging their investment but also support a position with some research and comparative data on the product potential. Lastly, settle on a % of the end user sales volume based on an estimate to which is agreed with the other party and insures that the purchase agreement for royalties entitles the agreed upon % on all future sales. The SBA assists prospective business owners in completing sound business plans, which can then be presented to a banker in applying for financial assistance. In the event that 2 banking institutions deny a loan application, a candidate can apply to the SBA for a loan guarantee that may assist in achieving a loan, since it would back up the application to a bank. (B) They typically want a great deal of control of the operation. 1. Angels are seeking companies with high growth potential, proven management and sufficient information about the company, its management team, and its market to be able to assess a company's value. 2. On average, Angels expect 10 to 15 percent above of the S&P 500 return on equity. 3. Typically, Angels invest in companies seeking between $50,000 and $1,000,000. 4. Angels generally prefer to finance manufacturing or product-oriented ventures, especially in the high-tech fields. 5. On average, Angels are 47 years old, have a postgraduate degree, and management experience in an entrepreneurial venture. An angel investor may ask for at least ten to twenty times return in just five years. For many angel investors, it’s not just about the money; they want to actively participate in developing your business. They want to act as a mentor and sometimes even to take an active role in managing the company. This often translates into the angel investor having a seat on the company Board of Directors. Angels are also highly interested in an exit strategy from for a full return on their investment in your business. The closest thing to it is an astute business plan that calls out the specifics of potential ROI, based on sound planning and analysis and addresses the following as possible exit strategies. Remember, investors are very aware that an exit strategy cannot be guaranteed. But they can be offered more than the wishful thinking that an IPO will occur in three years. It is always good to have a lawyer involved in complex documents or in the development of documents. This will further protect a concept. A lawyer does not necessarily have to be present during the exchanges with prospective companies, but a lawyer review and comment on documents before they are signed. 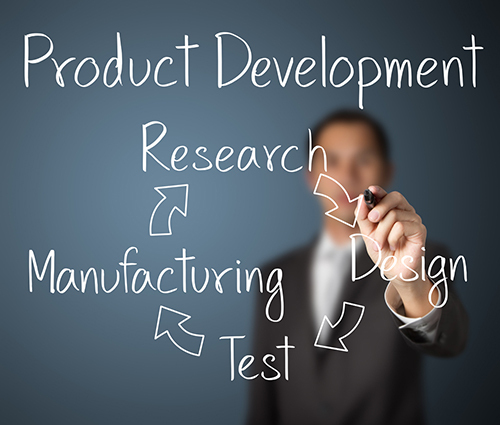 This article has conveyed preliminary steps for the small business in product development for the federal marketplace. It should be noted that much of the process discussed in this article is the same for the commercial product development and a certain amount of commercial success is usually achieved before selling products in the government contracting venue. The exception to that rule is in highly technical product pursuits where the government is funding advanced development. Should You Consider Small Business Governement Contracting? With careful structuring, planning and marketing, a product with potential can find its place in federal government contracting.